The Checklist is the step-by-step guide to findinng a excellent used car, truck, van or SUV. The first ting to notice is the space at the top for the automobile number. This number is to be taken from Appendix B. This is necessary for double-checking information you've gathered from the previous owner (if you are looking at a used car, truck, van or SUV on a lot). It is also necessary for reference to the average price of the car, truck, van or SUV you're looking at (Part I, Step 8). The checklist included in the ebook is divided into eight sections, “A” through “H”. These sections take you, step by step, through the inspection of an automobile. Each section begins with the area to be inspected. Some sections specify the operational status (engine running, power on, etc. ), and list some simple tools which are needed. Sections “D”, “E”, “G” and “H” are marked with a caution. Use care and common sense, plus the following precautions. Make sure the parking brake is securely set. If the parking brakes don't work, block the tires. Before inspecting a running automobile engine, remove neckties, jewelry (rings, watches, bracelets, necklaces, etc.). Keep your hands, loose clothing, rags, hair and tools away from the fan(s), belts and hot engine parts (radiator, hoses, exhaust components). It is safer to wear short sleeves rather than loose clothing with long sleeves. Keep long hair tied back under a hat or cap. 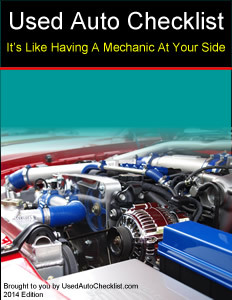 While inspecting, run the engine only in a well ventilated area, never in an enclosed garage. Most newer automobiles are equipped with electric fans. These fans may turn on even when the engine is not running, regardless of whether or not the key is in the ignition. Don't smoke during the inspection, especially around the engine, battery and fuel filler opening. To avoid the danger of being scalded, do not attempt to remove the radiator cap when the engine is hot! Pay attention to any special warnings. Most sections have areas of special interest marked with bold boundaries. These are items related to structural, internal engine and automatic transmission problems, all of which are costly to repair. Beware of automobiles which have problems in any of these areas and avoid automobiles which have both engine and automatic transmission problems. Each section has a portion of the items italicized. This is for your convenience. These items are not as crucial to the safety of the automobile as the items in bold print and especially the items in bold boundaries. If you are short on time, you may choose to skip these italicized items. It is not recommended to do so. By skipping these items, you are lessening your negotiating leverage and setting yourself up for unexpected repairs. Each item has two boxes. Mark the first (left) box when you have inspected the item, mark the second (right) only when there is a problem with the item. It might be easier, when you look over a completed checklist, to have used two different markings. For instance, an “X” on the first (left) box and a check on the second (right) box. With this method, you will know that checks indicate problems (see the example below). Since it will be unlikely any two automobiles you look at will have exactly the same features or accessories, there are spaces to write in the less common features. These are the spaces marked “other”. Some of the possible features are listed in each section's description. At the bottom of the checklist included in the ebook, there may be an area for comments. Use this area for specific information relating to items which are marked with problems. In other words, if you marked an item, write down why you checked it.